Seahawks defensive coordinator Dan Quinn is in line for the Falcons' head-coach job. Dan Quinn will be keeping at least two key members of Atlanta’s current coaching staff when he is officially hired as Falcons head coach following the Super Bowl. Multiple sources told FOX Sports that defensive line coach Bryan Cox and special-teams coordinator Keith Armstrong will remain with the Falcons. 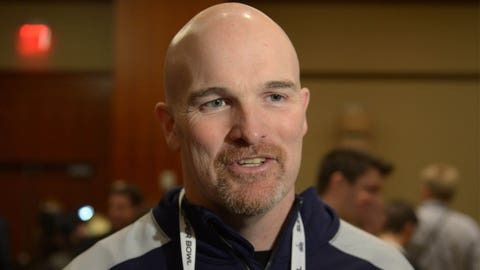 As FOX Sports NFL Insider Jay Glazer reported last Sunday, Quinn is expected to join the Falcons once his duties as Seattle’s defensive coordinator are completed. The Seahawks will play New England on Feb. 1 in Super Bowl XLIX. Cox and Quinn have a strong connection. Cox was Quinn’s assistant when the latter was coaching the New York Jets’ defensive line in 2007 and 2008. Cox, 46, joined the Falcons last season as defensive line coach after spending the previous two seasons with Tampa Bay as a pass-rush specialist working with the Buccaneers’ front-seven. Cox coached with the Jets, Cleveland Browns and Miami Dolphins during the previous six seasons. Cox also was one a standout linebacker from 1991 to 2002 who earned three Pro Bowl berths and posted 51.5 sacks in 165 career games. Exactly what role Cox will have under Quinn hasn’t been determined but it will involve work with the front seven, a source tells NFL on FOX. Improving the pass rush is a major priority for Quinn. The Falcons posted the NFL’s lowest sack total over the past two years under head coach Mike Smith, who was fired last month following Atlanta’s 6-10 season. Armstrong, 51, is considered one of the NFL’s top special-teams coordinators. He has held the position in Atlanta for seven seasons following stints with Miami (2001 to 2007) and Chicago (1997 to 2000). He also has NFL experience coaching defensive backs. Quinn and Armstrong were on the same Dolphins coaching staff in 2005 and 2006. Armstrong interviewed for the Falcons head coaching position following Smith’s dismissal. Armstrong landed on the NFL’s head coaching radar in 2012 when interviewing for vacancies with Chicago, Philadelphia and Kansas City. Behind the play of Devin Hester, Atlanta led the NFL in punt return average last season at 13.3 yards. Quinn’s coaching staff is starting to come together even though his hiring can’t be finalized until after the Super Bowl. Multiple media reports have pegged Kyle Shanahan being hired as Atlanta’s new offensive coordinator in place of Dirk Koetter, who left for the same position with Tampa Bay.